Why does AnyCount give zero results when counting PDF files? As a rule, zero results when counting PDF files mean that the files contain only image data. This means that the documents were scanned but not recognized. Only AnyCount 3D Enterprise can count such unrecognized PDF files. 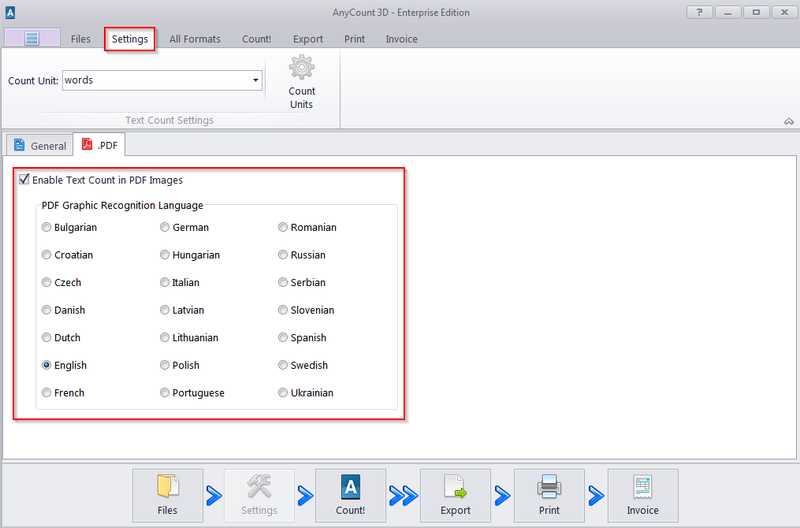 Therefore, if you have another version of AnyCount, we recommend you upgrade to AnyCount 3D Enterprise. 1. Click the Add button and add your PDF files to AnyCount. 2. Click the Settings button and switch to the PDF tab. Select the ‘Enable PDF Graphic Recognition’ checkbox and choose an appropriate PDF Graphic Recognition language. 3. Click the Count button. I cannot enable to PDF Graphic Recognition box. I have AnyCount 7 Professional edition.